So many of the Nesties rave about Gaiman fans that I jumped at the chance to give him a try. While this is my first book by Gaiman, I've seen and enjoyed his writing on episodes of Dr. Who. This is a short novel that reads like a dark fairy tale for adults. Our narrator has been away from his hometown for many years, but returns as an adult to attend a funeral. He feels compelled to visit his boyhood home, and the house at the end of the lane where his friend Lettie used to live. Once there, he begins to remember a magical past and a dangerous evil that he and Lettie faced as children. I was impressed with the quality of writing, just as I expected to be. 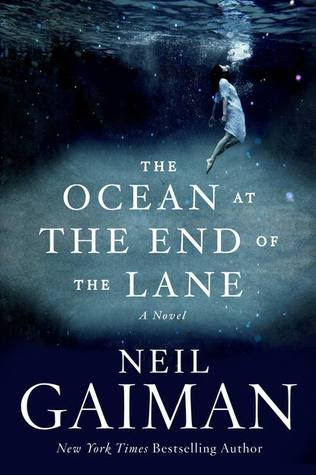 Gaiman captures the mood perfectly - it starts off innocent and child-like and quickly becomes dark and sinister. The protagonists are all well developed and interesting, especially Lettie. I also think Gaiman does a great job of combining the fantasy elements of his story with the real world. His magic system is intricate, but he doesn't waste too much time describing exactly how things work. While I really appreciated the quality of writing, I was less impressed by the entertainment value. It took me quite a while to really get into the story and then I lost interest again before it was over. It's not that the story wasn't well-developed and I liked the protagonists, but the antagonists just did nothing for me. I was mostly just confused and wanted more development in terms of explanation for motivation for the antagonists. That said, I did enjoy the middle of the story and experienced some of the deliciously creepy moments I was hoping for - just not as many as I had expected. I'm not sure this is the best Gaiman to start with. My friends who are friends are all raving over it, but I've heard responses similar to mine from those who aren't familiar with him as an author. It's great in terms of writing, but I just wasn't as excited about it as I had hoped. I'll definitely read the author again, based on the quality of writing. Thanks to William Morrow for providing me with a copy of this book to review! I can't believe this is your first Gaiman! :) I'd love to hear what you think of Neverwhere, if you decide to try his stuff again. That was my first of his novels, and it definitely got me hooked.